Dental Sleep Medicine is a therapeutic field that uses custom made oral appliances to treat Obstructive Sleep Apnea and sleep related breathing disorders. Oral appliances, also called mandibular advancement devices, adjust the position of the mandible forward, which can reduce or eliminate airway obstruction. Dental sleep medicine is an alternative to CPAP and surgery for Obstructive Sleep Apnea and sleep related breathing disorders. As these are medical conditions, dentists must work in conjunction with a physician to deliver treatment. As many as 1 in 5 American adults have some form of sleep apnea. This means that as many as 20% of your existing adult patients may present to be at risk of having this disease. DreamSleep providers utilize comprehensive screening techniques to identify those at risk as part of normal care visits. 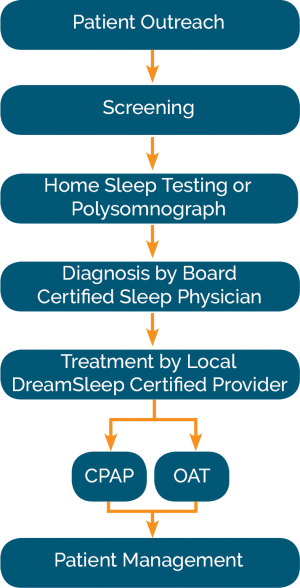 DreamSleep providers employ home sleep testings (HST) for most cases. Some situations may require referral to a sleep lab but patients usually prefer home testing. In most states HST units can be ordered or supplied by the dentist. However, New Jersey and Georgia require the test to be ordered by a sleep physician. The patient will sleep with the device for the required number of nights and the data is downloaded and analyzed by a board certified sleep physician who diagnoses the patient. Patients with a diagnosis of mild to moderate OSA can be fitted with an oral appliance. Those with severe OSA will be referred back to a physician who will consult with the patient on available treatment options. Qualifying patients will be evaluated for ideal device selection. DreamSleep dentists are specially trained to identify the appropriate device for different patients. With over 150 different devices on the market selecting the right device can make a big difference in patient comfort and therapeutic efficacy. The next step is to take impressions or do a 3D scan of the mouth depending on the available equipment. The impressions or scans, along with precise bite records, are then sent to the lab for fabrication of the selected appliance. When the device is ready the patient will return for fitting and titration. The dentist will fit the device and make initial adjustments, if necessary, for patient comfort and ease of use. Patients will sleep with the device and may need to return for additional titration until the proper fit is achieved. After ideal fit is achieved, DreamSleep dentists will order (or refer to order in NJ, GA and TX) a follow up HST. The titration test will validate the efficacy of the appliance. Should follow up testing indicate persisting problems, the dentist will perform additional device titration or refer to a physician for examination and consultation. Because an oral appliance is a medical device, FDA approved to treat a diagnosed medical condition, therapy needs to be billed through medical insurance. DreamSleep provides training for dental offices to understand and bill medical insurance. Some providers elect to use third-party billing solutions. Contact N3Sleep to learn more about how we can help you implement Dental Sleep Medicine into your practice. Whether you are just starting out or need help getting past some speed bumps, N3Sleep can provide your practice with an individualized program for whole team training, sleep medicine credentialing, physician referrals, medical billing and more.